Hi everyone! We have a new issue up at Paper Issues today....Birds of a Feather. Some of the PI girls got a chance to work with the Country Cookin' from our Sponsor Ruby Rock-It. I just love the fun patterns and the cooking theme. This cute oven cupcake box from Lori Whitlock is a perfect match for the cooking theme. I made a simple card to match with some of the die cuts and tags that are included with the collection. We want to see your Birds of a Feather projects. Head on over to Paper Issues to link up for a chance to win Ruby Rock-It's Country Cooking Collection. 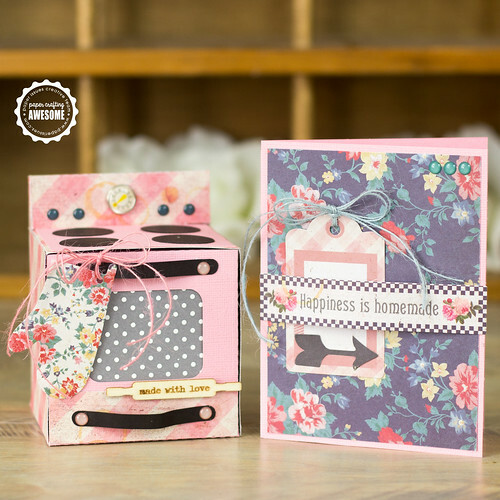 That stove card is soooooo clever Corri!! Awesome! Love what you've done and appreciate you sharing! That cupcake box is so cute! Where did you find the little clock brad? It fits so well here! Thanks for getting back to me so quickly, Corri!